Anyway, the event is on Thursday evening from 6 – 8 pm, so come and see all of the fabulous pieces! >Well, by now I hope everyone knows that Maggie Jackson is at 3 Kittens this week doing a couple of workshops for us today and tomorrow (there’s still room if you want to join us), plus a fashion show of the garments from her books this morning at 10 am. Have you signed up for “Knitting Daily” yet from Interweave Knits? It’s a great little blog which actually comes in your email. The reason I’m telling you about it today, though, is the Friday entry on The Four Knitting Truths. This article talks about how to make a garment that works for your body. There is a link in the article that takes you to a How to Measure Yourself page that includes photos. Two of the measurements are unique: Buddha Belly and High Tummy (both for ‘Rubenesque’ or ‘Goddess’ women). If you’ve ever made a sweater that you loved in the photo in the magazine or book or pattern leaflet, but found out when it was finished and on your body that it just didn’t work, I would highly recommend that you read this article and pull out the measuring tape! 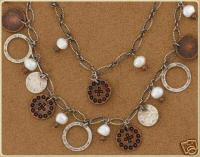 >3 Kittens will be hosting a Silpada Sterling Silver Party on Thursday, August 30th, from 6p – 8p. Be sure to stop by and see all of the latest in fall fashion accessories. 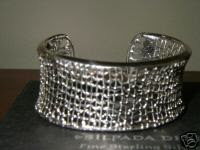 You can get a preview by visiting the Silpada web site http://www.silpada.com. Keep checking back, and as I get more store samples done, I’ll post photos of them. So, much going on with all of the Fall yarns arriving, events to plan, and most importantly a ton of work to get the Fall class schedule completed and published before the end of this week! You might have noticed on an earlier blog that Knitchique Sheryl has the Moebius Bowl offered five different sessions…and I want to tell you about the change in fee structure I have made to our Thursday night W.I.P. sessions. Starting with this month, August, W.I.P. fees will be $20 for the calendar month, so even when there are 5 Thursdays, the fee will still be $20! At least once every month, a yarn representative will sit in with us and talk about what’s new & educate us about their different yarn companies! I will be the “regular” W.I.P. instructor with qualified substitutes to fill in on those rare occasions I might not be available. Drop-ins are welcome, space available, for $10 a session. W.I.P. nights are a great way to get one-on-one assistance with those works in progress, meet new friends, meet industry insiders, keep up with all of the latest trends, and knit! I’m off to LA next week for my 40th high school reunion, so lots of work to to before departure and lots of fun activities to return home to! Thank you for supporting 3 Kittens Needle Arts!